The Christian church history of the Wolverton Manor is plainly a long one – stretching back over 1,000 years. We know that a church was built on the site of Holy Trinity in the 14th century and that it must have replaced earlier structures. The church was completely rebuilt in the early 19th century, although the 14th century tower was retained. The dramatic expansion of Wolverton Station in the 1840s led to the construction of St George the Martyr, consecrated in 1844, and a further chapel at the “Wolverton End” of Stony Stratford in 1865. Technically the church of St Mary Magdalene, long abandoned of course, was on the Wolverton Manor, but that is more properly discussed under Stony Stratford churches. The other part of Wolverton’s ecclesiastical history is the Bradwell Priory, built on land owned by the Baron Meinfelin, but just outside the Wolverton Manor. I have described the history of the Priory here. Christianity had a long run as a single denomination. Churches first of all owed their allegiance to Rome and after the Reformation of 1534 to the Church of England. In the 18th century the preaching of John Wesley led to the Methodist movement, which was popular in North Bucks and led to a number of chapels being established in Wolverton and Stony Stratford in the 19th century. I’ll discuss the Roman Catholic revival here and the protestant churches tomorrow. Roman Catholics had been consigned to the fringes since the reformation but were enjoying some resurgence in the 19th century. The influx of new workers from Scotland, Ireland, Lancashire and the North East of England brought many of the Roman Catholic faith to Wolverton. From the early days of the railway the Roman Catholics at Wolverton Station were incorporated into the Parish of Aylesbury and their nearest mass was at Weston Underwood, nine miles away. Not an impossible walk for people in those days but a daunting one which meant trailing through Haversham, Little Linford and Gayhurst. After 1860 the Roman Catholic community successfully petitioned the Bishop of Northampton who agreed to establish a parish at Wolverton. Father Francis Cambours was sent there in 1864 and he succeeded in raising £1000 towards the cost of a church. A year later he was replaced by Father William Blackman who stayed there a number of years. He first lodged with the Sarah Dunn, recently a widow, at 425 Gas Street and I suspect that for a time it served as the Presbytery. The new church, built on its present site on the Stratford Road opened in 1867 and was built at a cost of £885. Four years later a Presbytery was built next door to the church and apparently Sarah Dunn contributed over £200, probably her life savings, to this building project. She moved in with Father Blackman to serve as his housekeeper until her death in 1884. Pastoral care was administered from Aylesbury and Weedon under various arrangements for the first twenty five years and it was not until 1864 that a priest was assigned to the town. A year later Father William Blackman arrived and in 1867 the local congregation were able to open their new church, at that time on the western fringe of the town. The church remains today on the corner of Radcliffe Street and the Stratford Road. Roman Catholics arrived from the earliest in noticeable numbers. This was probably the first influx of catholics since the reformation who had probably been few in number in North Buckinghamshire, apart from those small pockets supported by the local ruling family. Wolverton and Stony Stratford were strongly protestant, and it is possibly for this reason (and I have no certain knowledge of this), that the founders of the church dedicated it to the 16th century Swiss divine, St. Francis de Sales, who had great success in restoring his Calvinist countrymen to the Roman Catholic Church. It appears that the church was originally planned as a school. In the mid-1860s Wolverton had second generation catholics who were starting their families, and schooling may have been uppermost in their minds. It may have been the intent to have a school room which could double as a place for worship and later build a church on the remaining land. This may explain the architecture, which is more school-like than church-like, and the orientation, which is from north to south, rather than the traditional east to west. Needless to add, whatever plan was in the founders’ minds did not come to pass. 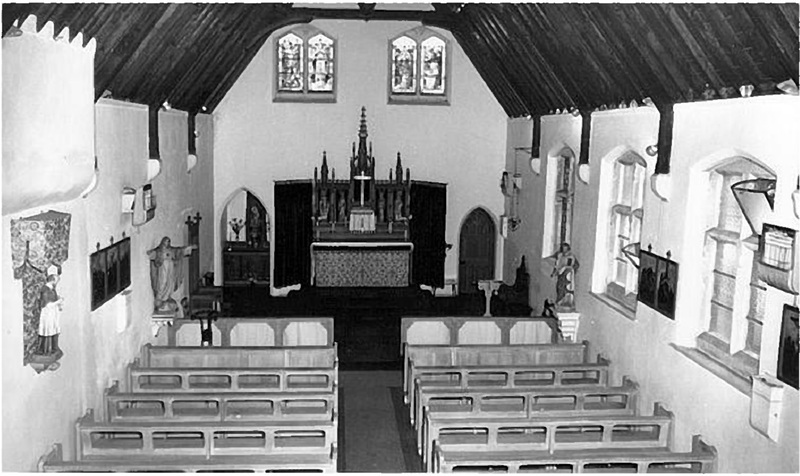 A second church, dedicated to St Mary Magdalene, was built in the 1970s.